Bigelow, Christopher Kimball. Kindred Spirits. Provo, Utah: Zarahemla, 2007. Returned missionary and ex-patriate Utahan, Eliza Spainhower unwittingly meets a potential mate when she leaves “pass-along cards” for proselytizing cards on a Boston subway car. As fervent a Mormon as she is, Eliza’s been disfellowshipped from full membership due to a recent sexual indiscretion that she’s still trying to repent from. 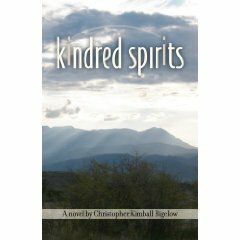 This new man (“a dark Easterner” ) Eric–a non-Mormon who she thinks could be converted–is making the path back difficult, however, and Eliza will test the limits of her own repentance process as she tries to simultaneously convert Eric and become intimately involved in his complex life. What makes it Marginal: A general irreverence or realistic/humanistic view of sacred rituals: for example, Eliza laughs at the way her father looks in his baptismal clothes. Realistic and sympathetic view of Wicca. Descriptions of pre-marital sexual activity. Respectful allusions to alternative/scholarly Mormon-themed journals like Sunstone and Dialogue. Eliza has a tarot reading. Descriptions of non-doctrinal Mormon beliefs. Key Quotes: “She told herself that she drank instant decaf simply for the good flavor, but she knew deep down that she was being a little passive-aggressive toward the church” (12). “After that she never binged and purged again, but she sometimes wondered about Hanniah, trying to remember more about her. Why had Hanniah chosen to take the devil’s side? Had Eliza almost followed on that path? As a tempting spirit, had Hanniah been whispering evil ideas into Eliza’s head since she’d reached the age of accountability?” (106). My two cents: The fact that Zarahemla publisher Bigelow self-published this title might make it easy to dismiss, but Bigelow confidently channels Levi S. Peterson‘s earthy realism, making a relatively conventional redemption/conversion narrative feel original, in a large part due to Bigelow’s obvious fascination with non-doctrinal Mormon beliefs which he at times bumps up against Wiccan beliefs and practices.